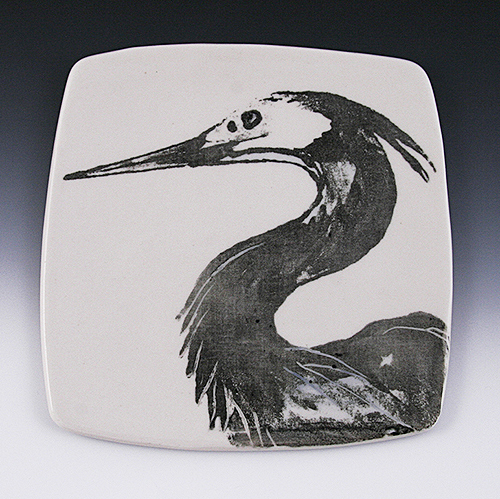 Here’s the monoprint of the heron on a porcelain plate that I posted a while ago, now glazed with a shiny clear glaze. I’m happy to see that the black in the print came through pretty well in the firing, as well as the texture from the cotton block. I’m going to make more of these soon. That is beautiful! Did you make the plate too ? I’m curious how this was done — did you glaze the plate first, then print, then re-glaze with the clear glaze? As you can tell, I”m not a ceramicist. BTW, I love your paintings – really nice work!